It’s not summer in Brisbane without the crazy storms and downpours that we regularly get. But how does all that rainwater affect your pool chemistry? If the weather has been particularly wet with a lot of heavy rain in a short period, you might notice an algae bloom in your pool. So how do you get rid of algae in a pool? Well first off, algae in a pool can be caused by a number of things. For example, if your pool over-flowed this can lead to run-off from your garden, with leaves and other debris getting into the water. Also as algae spores are generally air-borne, the rain also provides an effective means of carrying them into your pool water. The effect of all of this is that the phosphate levels in your pool can increase and provide perfect conditions for green algae to develop. Another risk factor from your pool overflowing is a loss of saltwater both from the water running off your pool and dilution from the rain. The additional rainwater can also change the pH balance and alkalinity levels in the water. 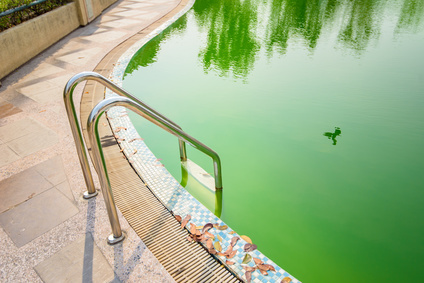 Both issues can cause the levels of free chlorine in your pool to dissipate and allow the algae to grow. If you’re noticing a few more algae patches on the floor, sides and steps of your pool, it’s time to take a few easy steps to stop this developing into a bigger problem. You may need to ‘shock’ your pool with a large dose of chlorine to kill off the algae that has already developed. You can also increase the chlorine production rate via your chlorinator for a few days to ensure adequate chlorine is being produced to keep the pool properly sanitised and prevent further algae growth. Vigorously brushing the walls, floor and steps of your pool will help remove the bulk of the algae and reduce the amount of time it takes to clear it completely. Get rid of all the rubbish you’ve displaced by brushing by running the pool crawler for a few hours. Ensuring the pH levels are within the right range will ensure the free chlorine concentration is maintained for effective sanitising. Repeat steps 2, 3 and 4 for a few days until all the algae has been removed. If you’re noticing algae blooms outside of periods of heavy rainfall, it might be time to get your chlorinator checked. Give us a call or bring your chlorinator cell and power pack in to us at Allchlor and we will run a health check to make sure it’s working efficiently and effectively.